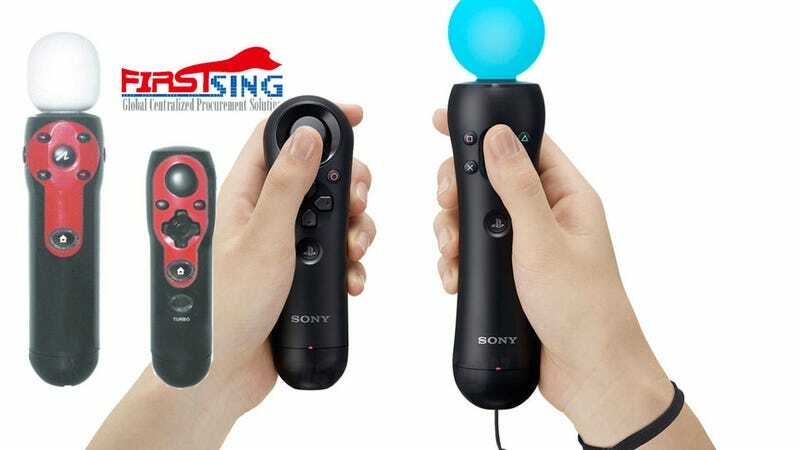 Hong Kong electronics distributor FirstSing claims to have the world's first third-party PlayStation Move controller for sale, and it might; I just don't see anyone actually purchasing it to find out. A cursory glance of the FirstSing FS18156 First Third-party Move Motion Navigation Controller suggests that it is exactly what people look for in a shoddy knock-off: odd color, cheap plastic, use of logos that don't belong to them. Where it fails is price. See, a low-quality third-party knock-off is generally cheaper than the real thing. At first $44.80 seems like a great price, considering the equivalent Move and navigation controller run about $80 here in the states. Fortunately we don't have to pay $60 shipping when we buy from U.S. retail outlets, an added fee that brings the grand total for this device to about $105, $25 more than just picking them up at the shop. Well at least they got first.